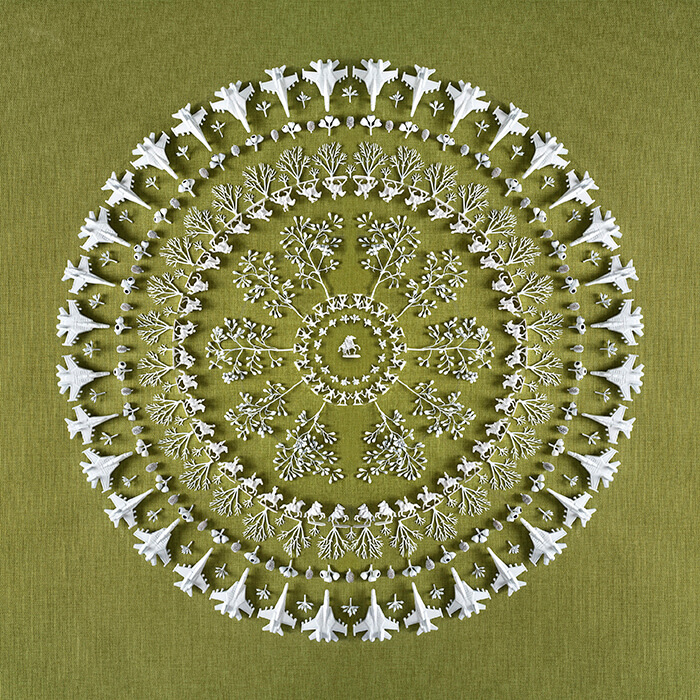 Aren’t they lovely, these beautiful, mandala-like photographs of Sally McKay’s? Doesn’t their intricacy and delicacy whisk you back to grandma’s house and all the comfort and reassurance that you once found among her handmade doilies and tapestries? Come a little closer. What do you really see? Plastic gures with plastic guns. Plastic observation towers. Plastic fighter jets and plastic tanks. All arranged in the neatest of circles, all chasing one another endlessly round and round the mandala with their rifles raised, each figure in the sights of the one behind. Sally McKay calls it “war plastic”, and the supply of it never ends. The figurines, forever frozen in their puddles of plastic, were ubiquitous in the Australian childhood. They’re still churned out in factories, and children the world over still use them to stage mock battles. But this is 2018, and now the toys come with a choke hazard warning. Pity the sea creatures who can’t read those warnings, and die in their millions because of various types of floating plastic waste. McKay is by training, practice and inclination a photographer, and the artworks on view here are photographs. But the last few years have seen McKay’s process veer towards a whole new way of working. McKay creates installations on platforms in her studio, using tweezers to painstakingly arrange objects in a circular pattern. She finds these circles “holistic”, and some of her admirers have likened them to mandalas. It’s a comparison she doesn’t dislike. In a previous series, exhibited at .M Contemporary in October 2017, McKay assembled and photographed circular installations made of oddments both manmade and natural, creating colour harmonies that she intended to open our eyes to the beauty in everyday objects that we often take for granted. In this new series, Blind Radius II, McKay goes further. She wants us to see beauty in all these lace mandalas. But she also wants us to be confronted by their components. But these components are not exclusively plastic. McKay also collected dead plant material from the floor of the mini forest in Cooper Park near her family home in Sydney’s east. She enjoys referring to nature in her work. “I wanted to show the link between plastic and what happens with our environment,” she says. In McKay’s work, the plastic and the vegetation are all painted white and arranged on coloured woven cotton in nine pretty colours from watermelon to egg yolk to slate blue. They are then photographed, and printed. McKay’s influences in these works are varied. Her childhood plays a big role. Her father Peter Linley owned and ran a Melbourne company called Interprint which printed catalogues and posters for the National Gallery of Victoria, and did printing for photographers. It was Peter who gave McKay her first camera when she was 12. Antique French lace is an obvious influence. And McKay has looked to several international artists – Indian-born Raqib Shaw, China’s Yao Lu and Michael Wolf of Germany. The works of Shaw and Yao Lu look beautiful for a minute, before you realise what you’re actually looking at. Shaw’s decadently coloured scenes of opulence and wealth feature flayed bodies and skeletons. Yao Lu’s photography appears to be of traditional Chinese mountain scenery before you realise those mountains are rubbish dumps. The photography of Michael Wolf takes us inside Chinese toy factories, where workers toil and sleep in squalid conditions to supply the global market with plastic objects of momentary, passing children’s play. In Wolf’s photography, piles of dolls’ heads awaiting assemblage are gruesome and repellently visceral. So here is McKay’s second solo exhibition. Just like grandma’s house. But watch out, Little Red Riding Hood, because grandma has grown some very big teeth.